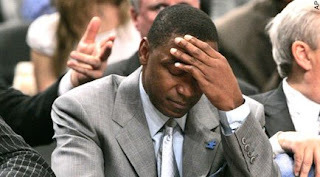 So...Isiah Thomas can have a job with the Knicks...as long as he promises never to contact any of the players, ever again. How awesome is that? So awesome I need to write an epic poem about it entitled Total Dillweed Gets What He Deserves. Or something like that. Speaking of dillweeds, let's hear it for Mini-Boss, Hank Steinbrenner, for not only totally undercutting his GM publicly when he said "...you don't have a guy with a 100-mile-per-hour fastball and keep him as a set-up guy. You just don't do that. You have to be an idiot to do that," but for also cheap-shotting Mike Mussina, who's been a class act and who's done whatever the club has asked him to do (I'm thinking of those 3 scoreless innings he came in relief against the Red Sox in game 7 of the 2003 AL championship series). Mini-Boss conspicuously left out Mussina when he mentioned the starters he thought would be "fine." Then he went on to bury Mussina saying Mike had to learn how to pitch "more like Jamie Moyer." What is thought by that comment is that Mussina needs to learn not pitch rely on his fastball, which, by the way, is EXACTLY the opposite of what Dave Eiland, pitching coach for the Yankees has been telling Mussina. Here's a quote from Eiland; "...thinks Mussina...must use his fastball more aggressively on the inside of the plate." So actually, Steinbrenner not only undercut his GM, a class veteran pitcher, but also his pitching coach. A trifecta! Way to emulate your old man and keep up the family name, Mini-Boss! Said this before, but wow. That kid, Jair Jurrjens looks like the real deal. I think Atlanta hoodwinked the Tigers on that deal. Just 22, and he's shoring up the Brave rotation with a 3.2 ERA and making some hitters look positively foolish. So the Vikings are trying to pick up Jared Allen. But didn't the owner of the Vikings make a big stink saying how he wasn't going to tolerate bad behavior. "The most important thing is not just the ability to impose fines and penalties, but to make the players understand their role in the community so that this will not happen again," he said. "They need that guidance, they need that leadership, they need those boundaries established. Boundaries, to be quite honest with you, have not been established for a long time." Well, fine. But let's take a look at Jared Allen. This is a guy who twice has been busted for DUI and has already been suspended 4 games. He swears he's off the sauce...and sure, even though he's investing his money in the promotion of alcohol doesn't necessarily mean he's partaking. Maybe he's fully remorseful. Maybe he's turning over a new leaf. Well, let's take a look at his new restaurant he just opened. It's called Jared Allen's 69 Club (after his number, of course...no other implication meant there) and serves Jared Juice -- fruit punch and Everclear. Judging by the "healthy-sized" girls serving the juice out of humongous bottles the motto Allen had emblazoned on all the glasses, “Wine ’Em, Dine ’Em, 69 ’Em," I'd have to say—Yeah, seems like Jared's completely over the DUIs and bad behavior—he's fine. Lotsa luck, Vikings. FANTASY SPORTS LEAGUES THE WORST THING ABOUT SPORTS....Pah-lease. Yes those of us who choose to tread this path are "sports geeks"....how are we any more geeks than those "sports geeks" who have BLOGS dedicated to sports minutie. If I recall correctly. you like to dissect the NFL draft, and you have magazines relating to this great event dotting the "reading room". I don't know what your beef is, but I think it is psychological. Why not just embrace your geekdom and join a yahoo league? All you gotta do is sign up online. You dont need to spend any $$. Its all good man. I am a married man, like many who are in internets leagues. dont worry, you wont whittle away your marriage because you spent 5 minutes a day analyzing your lineup. Oh by the way I had several beers when I wrote this, so take it for what it is worth. I think the Knicks should send Thomas to scout players in Eastern Europe. Maybe he will be able to use his "keen talent eye" and discover a diamond in the rough. Maybe the Knicks will get something out of all the money they wasted on him to date. You don't hear about sexual harassment charges in Croatia, so maybe he'll stay out of trouble and the Knicks won't have to shell out more settlement money. Nah, Zeke would find a way to screw it up. Hank's memory is short. Remember when Mariano Rivera was a set up man? He threw close to 100 and nobody was calling Torre "stupid." Besides, I haven't heard anyone say they were going to "keep [Joba] as a set up guy." I'm afraid that Hank is going to start doing crazy things like his old man used to. Jared Allen is going to a place that is chock full of Scandinavians and has a very cold climate. There isn't a heck of a lot to do up there but drink. Also, they paid that guy a heck of a lot of money and gave up multiple high draft choices. The Vikings are taking a big risk - but they're not going anywhere until they solve that QB situation anyway. I still love those uniforms, though. I think it is funny that Hank wants Mussina to be more like Moyer, whose season ERA since 2004 is: 5.21, 4.28, 4.30, 5.01 and 4.79 this year but that is just 4 games. Mussina's ERA in the same time span is .036 points less. So I would say he has been more like Moyer. I know that is cherry picking of stats, but even checking their other stats a lot of them are pretty close to each other. All they have to do is keep Mike Mussina away from the Red Sox. Against other teams this season, Mike has pitched 18.2 innings and has given up 6 runs; roughly a 3 ERA. Against the Red Sox, Mussina has pitched 8.2 innings and has given up 9 runs. So, just don't pitch Mussina against them and you should be fine.